The next in the Mr. Grey - Ghosthunter series is out today! A quiet honeymoon in England … that was the plan. But Claudia and Martin find themselves once again embroiled in a ghostly mystery. It will take all their skill, and a little help, to cut through the treachery and deceit shrouding the case of the groping ghost. 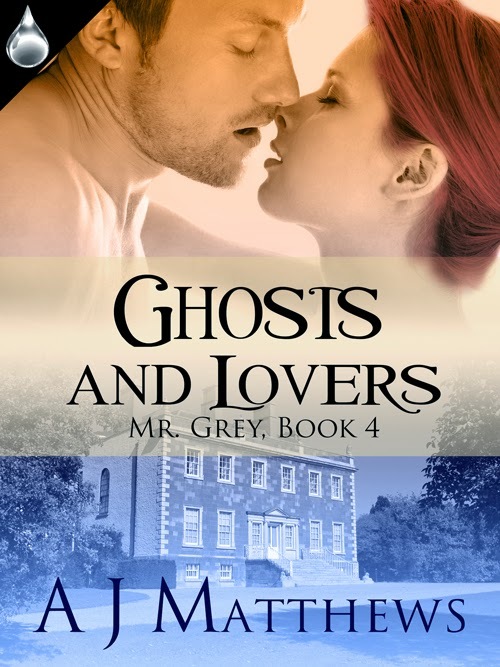 A. J. Matthews brings you the next exciting chapter of his hot, paranormal series, Ghosts and Lovers. Sometimes a ghost needs to get laid to rest! I received the invite to participate in a blog hop from the talented Cynthianna (link--www.cynthianna.com), author of humorous contemporary and fantasy romance. I hope you will take the time to hop over to her site and also visit the sites of the three authors who will be posting their comments on Monday, April 14. This Blog Hop – The Writing Process: What is the Secret - is all about authors offering others a glimpse into their work, their writing schedules, and perhaps their innermost thoughts. I’ll delve into my writing life a little here. I have two novels under way. The first is a YA novel co-written with my wife, and is intended to be the first book of a series. Some novels will continue the story as YA, others will be for the adult reader. Set on another world they have a steampunk flavor. The second is the next book to my Mr. Grey series (see above). Following on from their last adventure, the Greys are in Scotland seeking Claudia Mackenzie-Grey’s ancestors. What they find is more than they bargain for! My work tries to be positive in outlook. There are no unhappy endings or – my personal top dislike – just endings without resolution. I’ve always had a fascination with relationships, how they work and don’t work, the dynamics between people. Add to that interests in sci-fi, history and the paranormal and I was set to go. I also aim to have two works on the go simultaneously. Should one run out of steam - it happens - I pick up the other and carry on. I change out as needed, depending on whether the Muse speaks for one or the other. This way I don't lose momentum, which is a killer of many potential novels. My thanks to Cynthianna for the opportunity to take part in this blog hop!